DETOUR consists of the displacement of an anthill that developed at one of the FVCB foundation buildings, where the work was created. In addition to moving the anthill 1.5 meter from its original location, two identical drawings representing the outline of the anthill are cut in steel. One of these pieces serves as a foundation over which the entire organic structure of the anthill is moved. The second piece is on display next to the original location of the anthill. The drawings were made on polishing stainless steel, causing the mirrored surface to stand out as different from the landscape around it, while at the same time camouflaging itself within the environment. Intervention and installation with stainless steel plates and anthill. 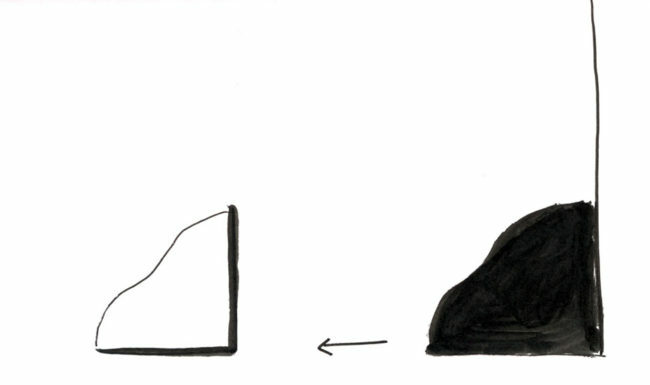 The shape of the anthill evoked a small mountain, a miniature mountain of sorts. However, unlike the shape of hills or mountains, this was a totally alive organic shape, inhabited and built by ants. Moving this structure would mean moving something to a place beyond physical form. It would mean to transpose a complex structure, possibly dislodging an ant colony. 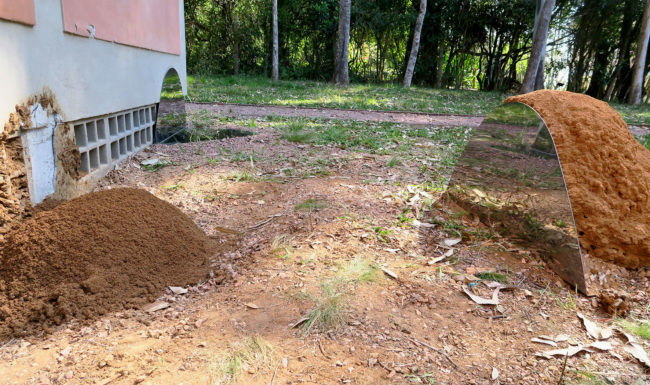 Although it may appear minimum in formal terms, moving the anthill 1.5 meters away from its original location would greatly interfere with that ecosystem. During the assembly stage of the piece, we found that this was an overlapping of colonies: a termite mound had developed next to the building that housed the foundation’s collection. Next to the mound, other anthills coexisted within the structure. The entire structure on the surface was moved: the anthill-mound was placed onto the stainless steel structure and then moved about 1.5 meters away from its original location. Soon a formal and reflective relationship developed between the displaced anthill-mound on the metal structure and the empty space in the original location of the structure – a hole of sorts next to the remains of the mound attached to the building maintained a record of the absence the removed structure had left behind. 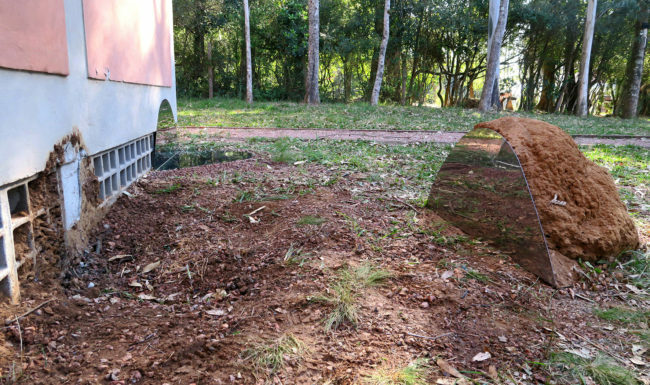 The other stainless steel piece, identical to the one used for displacing the anthill-mound was laid on the ground, next to the vestiges of the removal. 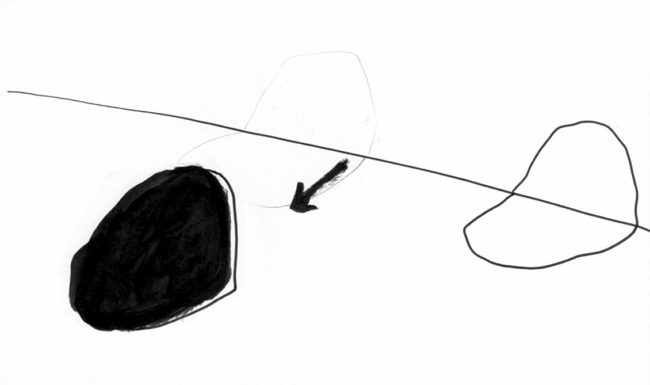 There, the two-dimensional shape is not so much a witness of the act that was carried out as an index that points to the original structure of the anthill-mound. 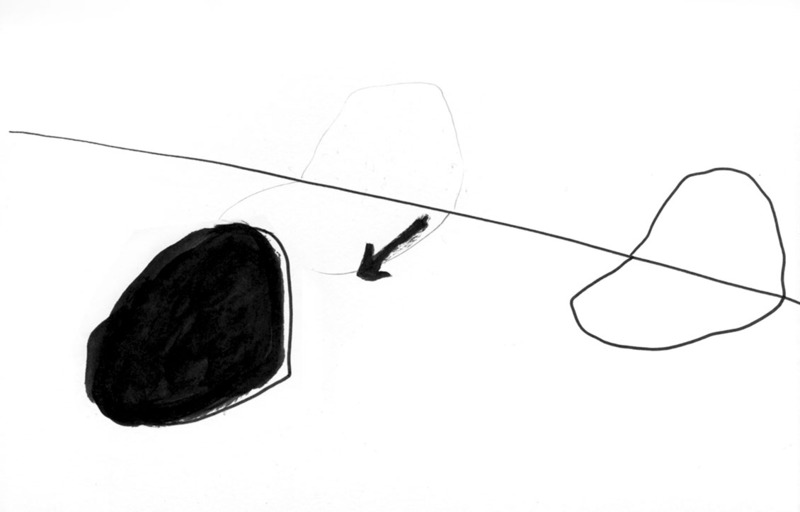 The two-dimensional representation references the absence of the structure, but also points at this absence as a visual account of the space around itself. 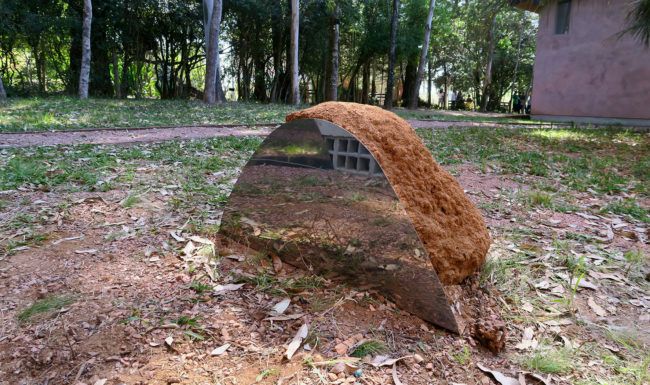 In this manner, the mirrored surface becomes a visual sink of sorts, moving us away from the organic and structural-structuring relationship of the displaced anthill. 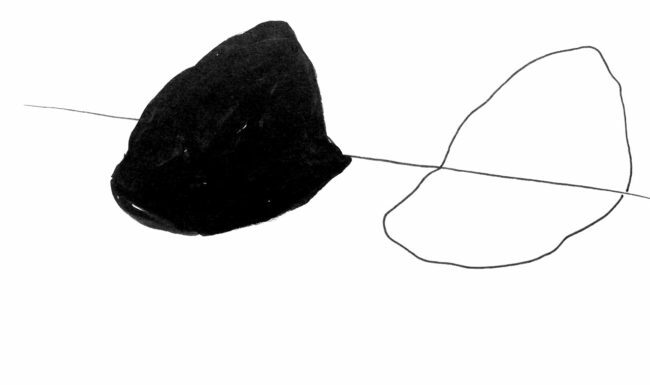 Although the two shapes are identical, the one used to displace the organic structure and the one displayed next to the original location of the anthill are of different and opposing natures. 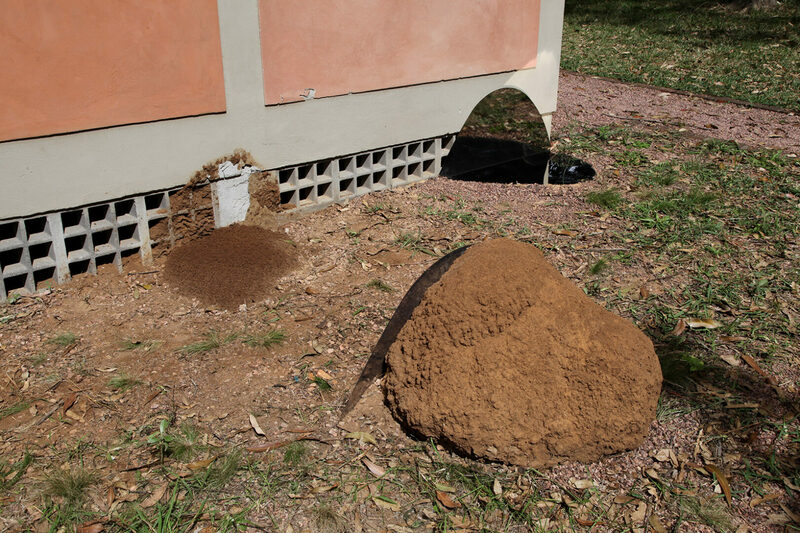 Two days after the installation of the work and the displacement of the anthill-mound, a new anthill, with a height of approximately 20 cm, had been created in the same location. The activity in the anthill continued and, very quickly, the reconstruction of the visible structure, above the surface, began. 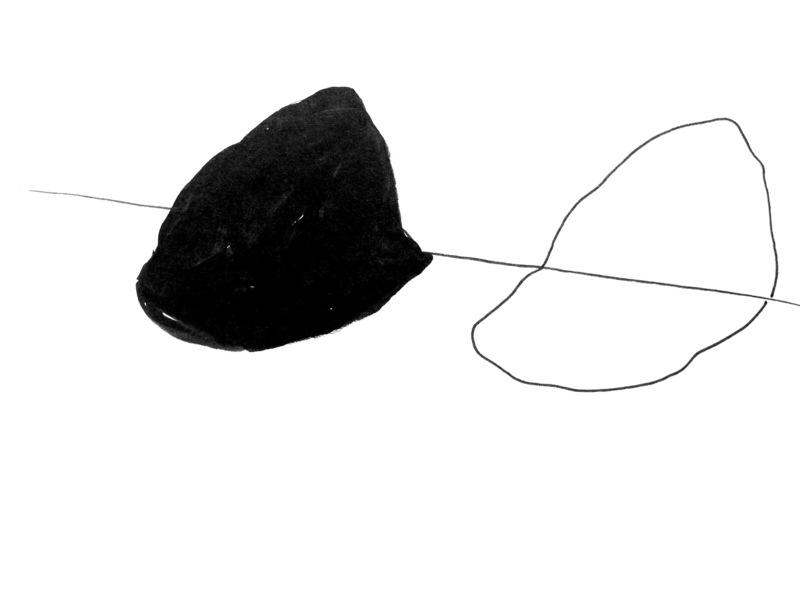 Little by little, the void left behind by the removal is being filled by a new structure, in what appears to be a persistence of form, or a repetition of the same structure that constitutes that form. Two replicas of the original shape are formed based on the structure of the original anthill: the two-dimensional stainless steel plates and the new anthill the ants are working to build. 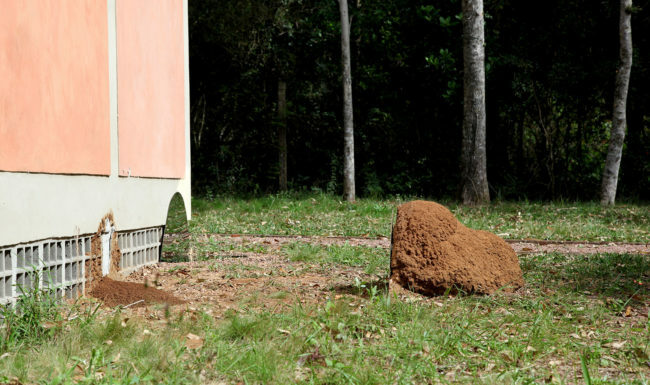 This work was executed outside Fundação Vera Chaves Barcellos foundation, in Viamão, Brazil, at the occasion of the Aã exhibition (from September 2 to December 16, 2017). Thanks to: Vera Chaves Barcellos Foundation, Ío (Laura Cattani and Munir Klamt), Adilson Tubin and Balduino Alves.